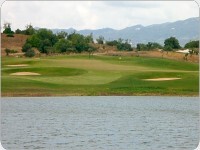 The Alamos course is one of the latest courses which opened in the Algarve in 2006. 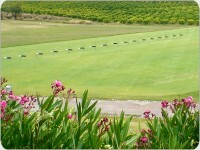 Lying to the north of Portimão it's located a few steps from the golf course of Morgado. 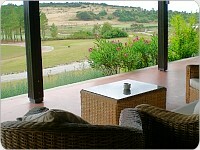 The setting is a large 980 hectare estate through undulating small valleys. The immediate main characteristic factor is its large greens which place demand on good putting skills as they are often raised above the fairway approach and involve several levels. Also, the accuracy of the player's shot will be questioned by deep aggressive bunkers. Take the road to the north from Portimão in the direction of Monchique and Silves and under the new A22 Motorway. From the access roundabout of the A22 follow the signs to Monchique and Silves. After 1.1 kms take the well signposted left turn and drive a further 1.2 kms to the west where you take a right turn into the Morgado Estate. Follow the road to the Club House. (11.8 kilometres in total). One of the nicest courses in the Algarve. 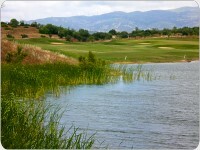 Great opening holes with water in play. 2nd hole is a gem, long approach over the lake. Overall, a great course with accurate driving and a 'risk and reward' 2nd shot on every hole. 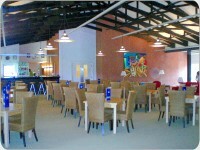 Alamos will become a top venue over the next few years. Play it now before it gets too expensive! Fantastic Golf Course - not the longest, but a true test of golf with some fantastic holes. Fantastic golf course, 18 lovely greens some out of this world holes, its a shame we only played it once. 2nd best golf course I've ever played. Play it now before the complex gets built, because then it may become more expensive.